Please order early; supply will be extremely limited on these items. Prototype: 4 freight car types, used on the German Federal Railroad. Type Gms boxcars as banana cars. Type Xlm low side cars loaded with the VW T1 "Samba" bus. Tank cars for petroleum oil products, privately owned cars. Type Tms refrigerator cars for deep frozen products. Model: The car types come 6 each with different car numbers in an attractive display. The cars have RELEX couplers. The automobile models are made of metal and come in 6 different color combinations (Schuco). Each car comes packed individually in a marked box, Length over the buffers for each car 11.5 cm / 4-1/2". 6 boxcars 00755-01 to 00755-06, 6 low side cars 00755-07 to 00755-12, 6 tank cars 00755-13 to 00755-18, 6 refrigerator cars 00755-19 to 00755-24. Prototype: Class 50 steam locomotive, class V 160 diesel locomotive, 3 ”Silberlinge” (”Silver Coins”) commuter cars, and 4 freight cars, all painted and lettered for the German Federal Railroad (DB). Model: The locomotives come with mfx decoders, controlled high-efficiency propulsion, controllable headlights and a sound generator with operating sounds and 4 other sound functions. The steam locomotive also comes with a Telex coupler and connections for a smoke generator that can be retrofitted into it. 2 commuter cars, 2nd class, and 1 commuter car, 1st/2nd class. 1 flat car for containers, 1 low side car with 2 automobile models, 1 sliding roof gondola car, and 1 gondola. Train lengths 98.0 cm / 38-9/16” and 75.5 cm / 29-3/4”. Contents: 14 no. 24130 curved track, 8 no. 24188 straight track, 1 no. 24088 feeder track, 9 no. 24172 straight track, 1 pair of 24671 and 24672 curved turnouts. 120 volt / 60 VA transformer. Central Station. Illustrated instruction manual with all sorts of tips and ideas for setting up the starter set. This set can be expanded with the C Track extension sets and the entire C Track program. The turnouts can be retrofitted with the 74490 electric turnout mechanism. Getting started in the model railroad world of Marklin Systems with 2 Era III Trains. Commuter train, freight train, and a large C Track layout. New Central Station and transformer included. Locomotives with "mfx" decoders and high-efficiency propulsion motors. Steam locomotive with a Telex coupler for switching operations. Great sound: diesel motor and steam locomotive sounds, and more. Different horn/whistle sounds in both locomotives. Prototype: Swiss Federal Railways (SBB) class 460 and class 660 (Ae 6/6) electric locomotives, 3 type Mark IV express train passenger cars and 4 freight cars. Model: The locomotives comes with mfx decoders, controlled high-efficiency propulsion, controllable headlights / marker lights, and sound effects generators with several sound functions. 1 each express train passenger car, 1st class and 2nd class, and 1 dining car. 1 gondola, 1 stake car, 1 tank car, and 1 bulk freight car. Train lengths 101.2 cm / 39-13/16” and 84.9 cm / 33-7/16”. Contents: 14 no. 24130 curved track, 8 no. 24188 straight track, 1 no. 24088 feeder track, 9 no. 24172 straight track, 1 pair of 24671 and 24672 curved turnouts. 60 VA transformer. Central Station. Illustrated instruction manual with all sorts of tips and ideas for setting up the starter set. This set can be expanded with the C Track extension sets and the entire C Track program. The turnouts can be retrofitted with the 74490 electric turnout mechanism. Getting started in the model railroad world of Marklin Systems with 2 Era V Trains. Different horn sounds in both locomotives. Model: The locomotive comes with a digital decoder, and a controlled miniature motor. 2 axles powered. 2 track adhesion magnets for greater pulling power. The locomotive has separately applied metal grab irons and other details. The headlights are maintenance-free LED's. The headlights will work in conventional operation and can be controlled digitally. The acceleration and braking delay can be controlled digitally with a Control Unit or Marklin Systems. Length over the buffers 7.4 cm / 2-15/16". Prototype: Hoyer Railserv, Inc. class 185-CL 004 general-purpose locomotive. Dual system locomotive. Model: The model is constructed of metal with many integrated details. The total design of the locomotive is ideal for model railroad operation. The locomotive has a digital decoder and a special can motor. 4 axles powered through cardan shafts. 2 traction tires. The headlights are LED's, will work in conventional operation, and can be controlled digitally. The locomotive has adjustable running characteristics. 2 pantographs that can be raised and lowered manually (they are not wired to take power from the catenary). Length over the buffers 21.7 cm / 8-9/16". Container cars to go with this locomotive are available as item numbers 47452, 47707 and T24330. Prototype: Austrian Federal Railways (BBÖ) class E18 42 express locomotive. Later designated as the ÖBB's class 1118.01. The two-color paint scheme was for important long distance passenger service. Model: The locomotive has an mfx digital decoder and controlled C-Sine high efficiency propulsion. 2 axles powered. 4 traction tires. The engineer's cabs and engine room have interior details. Metal grab irons and other details are separately applied. The driving wheels have a reproduction of the quill drive. The headlights will work in conventional operation and can be controlled digitally. The low switch speed switching range or the acceleration and braking delay can be controlled digitally with a Control Unit or Marklin Systems. Length over the buffers 19.5 cm / 7-11/16". New compact design, powerful C-Sine motor. mfx decoder with a feed-back feature in Marklin Systems. Metal construction with many separately applied details. Eight class E 18 express locomotives were built in Austria starting in 1938 as road numbers E 18 201 to E 18 208. After World War II the Austrian Federal Railways (BBÖ) added two original locomotives from the German State Railroad to this group. One of the two was used for spare parts. The other unit was designated as road number E 18 42 and was the fastest locomotive in Austria for many years. In 1952, this locomotive was used for publicity purposes in an attractive two-color paint scheme along with newly overhauled prewar passenger cars to present the resumption of long distance passenger service – now under electric catenary operation. After the founding of the ÖBB (postwar Austrian Federal Railways) further expansion went forward modestly with uniformly green cars and locomotives. These locomotives then became the class 1018; only the fast E 18 42 became the 1118.01. It was updated in 1967 and was run in a Jaffa orange paint scheme until 1985. Express train passenger cars to go with this locomotive are available as item no. 43228. C-Sine high-efficiency propulsion with a maintenance-free motor. mfx decoder with a feed-back function (in Marklin Systems) and sound effects. Prototype: Allgäu Express as a joint project of the Bavarian Provincial Railroad (Regental Railroad, Inc.) and the Swiss EuroTHURBO, Inc. (SBB). Type Am compartment car, 1st class; type Bm compartment car, 2nd class; and type BRDpm open seating car, 2nd class with a "Bistro" area. Model: The cars are ready for installation of current-conducting couplings. Adjustable buffers. Total length over the buffers 81.2 cm / 31-15/16". Interior lighting can be installed via Marklin kit #7330. The locomotive for the Allgäu Express is already available as a Marklin model: Item no. 36848 class ER 20 "alex" diesel locomotive. Prototype: Austrian Federal Railways (BBÖ) express train passenger cars. 1 type AB4üh skirted passenger car, 1st and 2nd class. 1 type Group 28 B4ipüh car, 2nd class. 1 type Group 28 C4üh car, 3rd class. 1 type Pw4üh baggage car with conductor's cupola. German State Railroad designs, overhauled for important long distance service. Model: The cars have Görlitz design trucks. Train destination signs as decals are included. Retracted diaphragms for the ends of the train are included. All of the cars come individually packaged. Total length over the buffers 97.5 cm / 38-3/8". Interior lighting can be installed via Marklin kits #7330 and #73150 . The electric locomotive to go with these cars is available as item no. 39681. Prototype: Type Uapps covered hopper cars for transporting grain (Cerealier), used on the Belgian State Railways (SNCB/NMBS). Privately owned car design painted and lettered for the firm CITA S.A. Belgium in association with the French company TMF. Model: The cars have metal inserts for a low center of gravity and quiet running. The cars have many separately applied details and come packed individually. Total length over the buffers 51.5 cm / 20-1/4". 47125 - Set with 2 "Sports Car" Automobile Transport Cars. Prototype: German Railroad, Inc. (DBAG) type Laekks 553 double units, used by the firm Autotransportlogistic GmbH (ATG). Bi-level design for automobiles. Used for transporting the current Cayman and Carrera S cars for the firm Porsche. Model: The upper decks can be lowered. Hinged drive-over plates are at the ends of the cars. The cars come loaded with 16 metal automobile models. Both types of automobiles come in different exclusive paint schemes. Suitable chock blocks are included. Each car comes packaged individually with its automobiles. Total length over the buffers 62.1 cm /24-7/16". 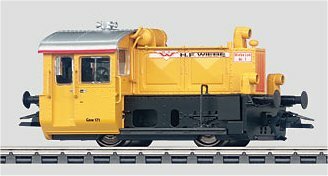 An electric locomotive to go with this car set is available as item no. 39835. Prototype: Type Saakms, used on the Swiss Federal Railways (SBB/CFF/FFS). Privately owned car painted and lettered for the firm HUPAC S.A. for transit traffic on the "Rollende Landstraße" / "Rolling Road". Model: End car with 2 hinged and removable buffer beams. This car can also be used as an intermediate car. Chock blocks for truck models and special couplers for coupling to cars and locomotives with standard couplers are included. Length over the buffers 23.2 cm / 9-1/8". Prototype: German Railroad, Inc. (DBAG) type Sdgkms 707. 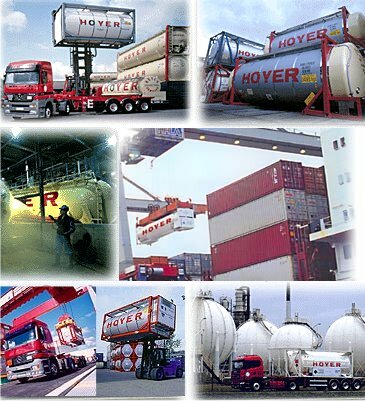 Used for transport of containers, interchangeable truck rigs, or semi truck trailers. Twenty foot tank containers with frames surrounding them to support and protect them. Model: The car has a metal frame, floor and load cradles. The car has special low-riding trucks and many separately applied details. The load restraints are adjustable. The car comes loaded with 2 tank container models with different registration numbers. Length over the buffers 18.9 cm / 7-7/16". An electric locomotive to go with this car is available as item no. 36858, and other cars to go with this car are available as items 47707 and T24330. Prototype: German Railroad, Inc. (DBAG) type Lgns 570 flat car for containers. Twenty foot tank containers with frames surrounding them to support and protect them. Model: The car has a prototypical partially open load surface and separately applied axle bearings. The car comes loaded with 2 tank container models with different registration numbers. Length over the buffers 19.1 cm / 7-1/2". An electric locomotive to go with this car is available as item no. 36858, and other cars to go with this car are available as items 47452 and T24330. Prototype: Type Kbs 443 stake car with a brakeman's platform. Model: The car comes painted and lettered in the current design for the Marklin Magazin. The stakes can be removed. The car comes loaded with real rolls of printing paper stacked and tied down. Length over the buffers 15.7 cm / 6-3/16". This car continues the series of special cars for the Marklin Magazin, which was begun in 1986 with a small flat car with a container. Universal circuit board with several LED's, which will fit in most of the passenger cars in the Marklin H0 program. One 73400 is required for a short car (example: Langenschwalbach cars); for long cars (example: UIC-x at 28.2 cm / 11-1/8" length) two 73400 are required. The circuit boards can be plugged together in a series or they can be shortened. Mounting hardware is included. The separate 73405 or 73406 pickup shoe / ground spring power feed set, or the 73020 current-conducting coupler is required, depending on the car type. A 73405 or 73406 pickup shoe / ground spring power feed set, or the 73020 current-conducting coupler is required for the 73400 lighting kit. For the 73400 interior lighting kit. Includes a symmetrical pickup shoe and a ground spring.. The combination of 2 x 73400 + 1 x 73406 can replace the 7335 interior lighting kit. Prototype: German Federal Railroad (DB) type G11 boxcar. Former type Gl "Dresden". Model: The car has sliding doors that can be opened and many separately applied details. Minimum radius for operation is 1,020 mm / 40-5/32". Length over the buffers 37.5 cm / 14-3/4". Additional Contents: "Bad Filseck" station as a kit building. Area dimensions 80.0 x 29.0 cm / 31-1/2" x 11-7/16". Track for 2 sidings: One each turnout left and right, 22.5°, radius 1,020 mm / 40-5/32", 5 sections of straight track 300 mm / 11-3/4", one each section of straight track 150 mm / 5-7/8" and 59.5 mm / 2-3/8" as well as 2 track bumpers with lighted lanterns. This extension set is the ideal expansion for the 1 Gauge starter sets: a station with 2 loading tracks for freight service with that first car load of less-than-car-load freight. The composition of this set has been made up particularly with the 55033 Era III mega digital set with 2 trains in mind. Prototype: Low side car with a brakeman's platform. Model: The car comes painted and lettered in the current design for the Marklin Magazin. The car comes loaded with real rolls of printing paper stacked and tied down. Length over the buffers 56 mm / 2-3/16". This theme car for 2006 represents the procurement of paper for the Marklin Magazin, the stuff of which dreams are made. A full carload of over 20 metric tons of this basic material is required for each issue.